We’re more than a distributor. There’s more to our company than supply and demand. While any regular distributor could keep someone in business, they’re less likely to help you grow your business, market your products, and increase your community presence. If you’re looking for more, you’ve come to the right place. Our customers are #1. Whether you’re partnering with us in your first year or your fiftieth, you are our top priority. We build and maintain great relationships with our customers, and we attribute our success to those positive relationships. 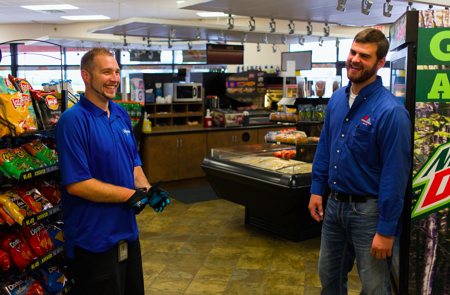 Our Team Members know the Convenience Store industry and our product offerings very well. We keep a pulse on industry trends and changes. Expect Bernick’s to ask the right questions to understand your business needs, including maximizing your delivery schedule and advising on seasonal trends. With 100 years of experience serving the Central Minnesota area (an many years in the Greater MN and Western Wisconsin areas as well), you’d be hard-pressed to find a more time-tested company to partner with. It’s through community support that businesses are able to succeed. We’re so thankful for everything the community does for us, and to show our thanks, we give back. Bernick’s supports education, sustainable living, responsible consumption, and healthy lifestyles. During the beginning stages of partnering with Bernick’s, we take time to learn about who you are. By taking time to learn about your business, your goals, and your future. Our experts identify ways your business can stay competitive and reach success. As you know, problems can come out of anywhere. Our team is a resource, even for problems not directly related to distributor services. Our expert team have seen any and all types of problems over the years. Anything from staffing to advertising to repair, our network is strong and responsive. The peace of mind that comes along with having an experienced, reliable, and dedicated partner is something money can’t buy. Businesses that partner with Bernick’s know they have more than a vendor or a distributor. They have a partner who’s as invested in their success as much as they are.